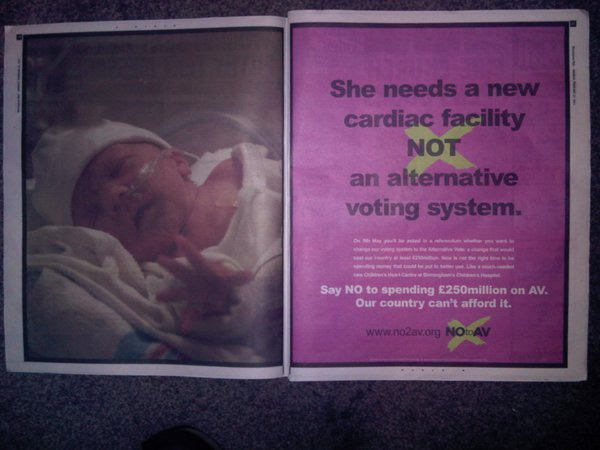 The Tory-led NO to AV campaign have over-stepped the mark with their latest advert against the alternative vote. Judging by the reaction on twitter, the Tory-led NO to AV campaign have over-stepped the mark with their latest advert against the alternative vote. Yesterday’s Birmingham Post carried this picture bearing the legend ‘She needs a new cardiac facility NOT an alternative voting system”. The ad, which is due to be rolled out to national publications in the coming days, goes on to remake the discredited claim that £250 million would be spent on AV. As Left Foot Forward and Next Left showed last week the £250m includes £130m for electronic vote counting machines which are unnecessary and the £82m cost of the referendum which gets paid regardless of the result. More galling than the false claims are those behind the attack ad which seeks to play on the public’s concerns about cuts. The No to AV website outlines that £250m could be better spent on “2,053 doctors, 5,719 police officers, 6,297 teachers, 8,107 nurses, 36,000 hip replacements or 60,000 school places.” But campaign chief, Matthew Elliott, was the man behind the TaxPayers’ Alliance’s joint report with the Institute of Director’s in September 2009 titled ‘How to save £50 billion‘, which recommended now-adopted coalition policies including cutting Sure Start and abolishing Education Maintenance Allowances. Without a hint of irony, the frontpage of the No to AV website today even asked whether the money could be better spent on the Sheffield Forgemasters loan which was scrapped by George Osborne. But they were found out by the Financial Times’ Christoper Cook who reported that the Department for Business said it was untrue that the loan would be reinstated if there was a ‘No’ vote in May. The approach is exactly as predicted on Left Foot Forward in November. With polls today showing quite how tight the referendum has become it seems there is no limit to how low the No campaign will stoop. 'Keep FPTP or we kill the baby'? http://bit.ly/eYXyr5 Stay classy, No to AV campaign etc. etc. Whilst I will be voting no, I find it interesting that the no campaign is suddenly concerned about public services. I don’t know if you can edit your post, but if so, please can you remove the phony “yes2av” link because it’s only helping promote that site and push it up the rankings. The more people who support the Yes to the Alternative Vote System and link to http://yes2av.wordpress.com/ for yes2av the better the chance of that other link being knocked off the top place. http://tinyurl.com/4w9egst F.F.Sake what is going on in some ad/spin heads???? Well things have been terrible under two party thinking for many years, which is not really democracy in action, its winner takes all in action. I am not convinced or fully educated about AV, but if the Tories oppose it this much, and this crudely, insulting our intelligence, then their disgraceful argument is now going to make me vote against them just because I want to see them squirm. If they dont want it, I do. Their priority along with Labour is to keep the 2 party system alive, they prefer a 50/50 chance of taking all rather than a smaller chance of having a proportional influence in how our country is run. Its sad how many people focus on the differences between political parties; we mostly want and NEED the same things whatever we believe in. Don’t let them divide us. @Graham Marsden, apologies, I cannot edit posts. I think Google’s PageRank is complex enough that it doesn’t merely rely on hits in order to compute relevance though, so I don’t think I’ll have caused any damage here. Interesting point though, and thanks for pointing me to the genuine site too. @Cardiac Care Centre, the ad contains incorrect information – the cost stated is incorrect. Of the £250m “cost”, £130m is for machines that aren’t needed and won’t be bought. That is a fabrication. And £82m is for the referendum itself. Even if you choose not to believe these facts, ask yourself this – would a Government who has just gone so far out of its way to cut spending in these areas really spend this money on the NHS if this money was saved? We don’t have a budget crisis. We have a not appropriately taxing people who can afford it crisis. And I absolutely will not give up my right to vote for what I believe in just because it has a price tag, and especially when that price is less than the average bank boss’s bonus. We want more cardiac facilities, and that’s why we need to vote yes – because then our votes will count for more when we go to the polls in an attempt to elect a government who actually value our NHS. Vote no, and you’re only helping the people who will take these cardiac unites away from you. We want our MP’s elected by a majority of voters not less than 20% less than 20%. We are all crying out for electoral reform, but AV most definitely is not it. no more CUTS , more fairer system for everybody needed. 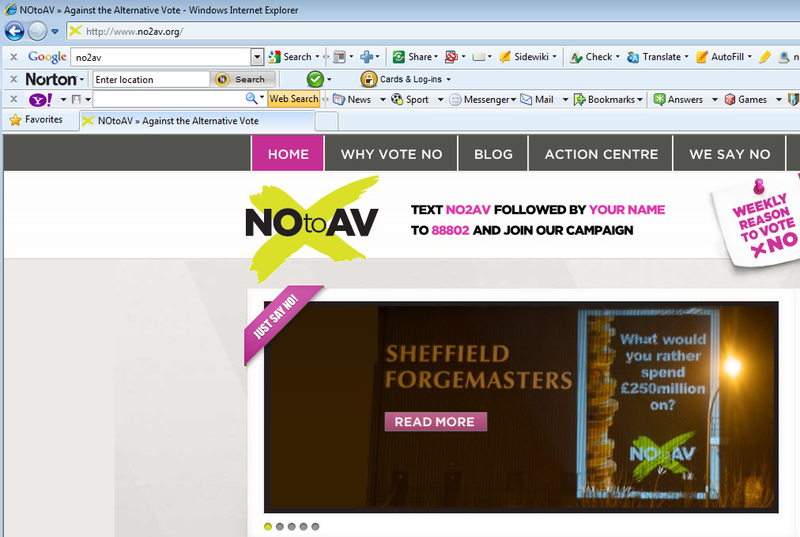 RT @leftfootfwd: The nasty campaign: NO-to-AV stoops to new low http://t.co/FHjFmUHI How low will they stoop? ?